Whether your hospital is connecting telemetry monitors, X-ray machines or lab equipment, a reliable network has become a necessity. And with the recent spike in cyber-attacks, the need for security has increased tenfold. Interfaith Medical Center, a not-for-profit healthcare organization based in Brooklyn, NY, is taking no chances when it comes to the safety and well-being of their staff and patients. They have implemented a Zero-Trust environment that uses micro-segmentation to eliminate threats and improve patient safety. Not only does this network protect their medical devices and patient data, but the safety of their patients as well. Here’s a deeper look into Interfaith’s Zero-Trust environment in the infographic below. 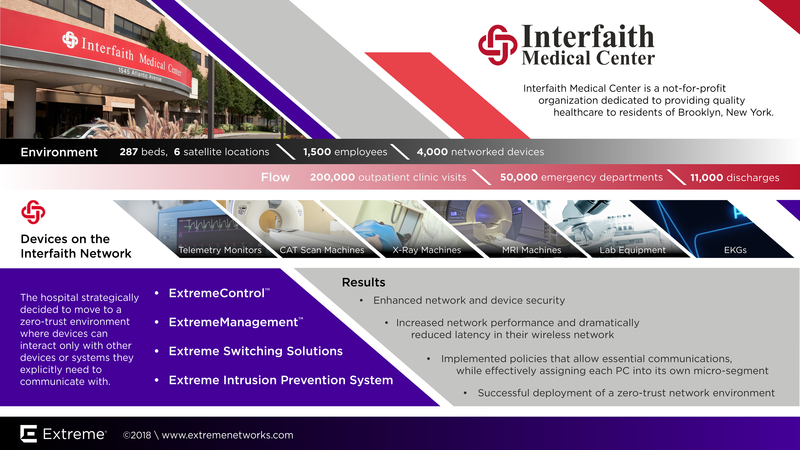 To learn more about how Interfaith Medical Center utilizes their network check out their customer success story.